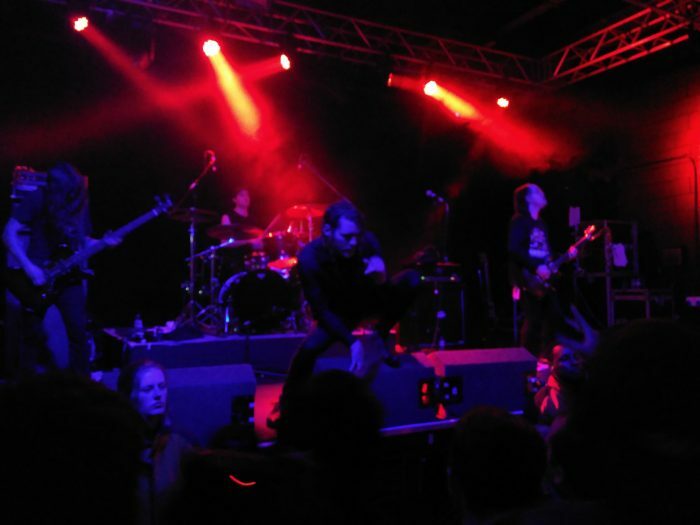 Deafheaven are one of the most discussed acts in modern black metal, thanks to gaining crossover recognition among the wider sphere of alternative music admirers who find much to love in their blend of extreme metal, post-rock and shoegaze. Tonight, they bring their inimitable blackgaze sound to the upgraded venue of Leeds University Stylus (following overwhelming demand for tickets) and they rise to the occasion. Armed with crystal clear sound from the instrumentalists and a striking performance from frontman George Clarke, the group command the stage from start to finish, playing a set packed with the finest cuts from all three records, along with a surprising cover song. Before Deafheaven take to the stage, chatter amid the crowd unearths a consensus of disappointment of the venue change; the gig isn’t to be held at the previously announced and beloved Brudenell Social Club, a grittier, smaller venue with no security barriers (and cheaper beer). 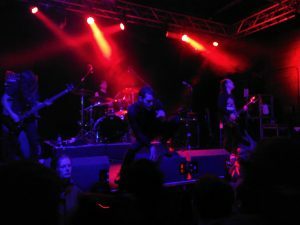 The larger venue bestows Deafheaven a challenge to overcome, however they possess added resilience from their huge shows at Roadburn festival and London two days prior. Attendees warm to the setting, despite a fan cheekily shouting “it would have been better at Brudes!” to audience laughter. 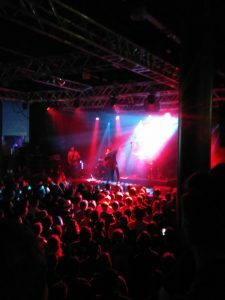 Opening with a triple threat of ‘Brought to the Water’, ‘Baby Blue’ and ‘Come Back’ from New Bermuda, Deafheaven manoeuvre through chugging riffs, eerie slide guitar parts and gorgeous melodic moments with sheer ease, their dynamic interplay intensifying the drama twofold in a live environment. George Clarke’s theatrical stage presence is a joy to watch; his demonic gaze matches his piercing screams as he postures around the stage. He even remains energetic during the lengthy instrumental parts, his arms moving in time to the music as if he were conducting the band. 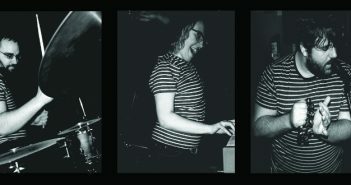 Clarke hypes up the energetic attendees at the front of the crowd and captures the stationary onlookers’ attention whilst the rest of the band sway gently. He announces they are going to play ‘Language Games’ to cheers. This unexpected cut from their début album Roads to Judah is then followed by the second curveball selection, ‘Cody’- a Mogwai cover. Deafheaven “blacken” this formerly delicate track, replacing the hushed vocals from the Glaswegian post-rockers with blood curdling screams and append a punishing outro complete with hostile blast beats and breakneck tremolo picking. The first mosh pits of the night start as the fan-favourite track ‘Dream House’ is performed; Clarke approaches the audience on the barriers during the final segment, with fans piling in to grasp the electrifying vocalist, screaming the outro in unison with him and one another. They close the night with the admirably selected tracks of ‘Sunbather’ and ‘The Pecan Tree’ which see more interaction from Clarke, adding a performer-to-audience bond which breaks down the ostensibly lost intimacy of the venue upgrade. The band walk off with their heads held high and without an encore, their immaculate performance a more than ample statement tonight. N.B. The reviewer was unable to attend support band Hundred Year Old Man’s set. Youth Code were initially meant to support, but after they were announced for playing Roadburn that night, there was no further obvious announcement about a replacement support act.